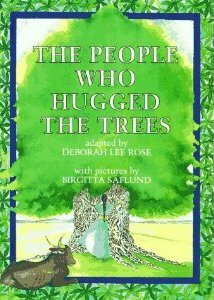 The People Who Hugged the Trees is a beautiful adapted tale from India about the importance of not only protecting the environment but also standing up for what you believe in. Amrita from a village in India, visits—and hugs—her favorite tree in the nearby forest each day. She is very wise; she respects the trees in the forest because she knows that they protect her village from desert sandstorms and provide shade from the hot desert sun. Without the trees, the village would not survive. One day, Amrita notices a group of men armed with axes headed toward the forest. Their mission is to chop down the trees to get wood for the Maharajah’s new fortress. Amrita stands tall, guarding her favorite tree, but the men push her aside and chop down the tree. So she runs to gather the villagers, who all stand guard in front of—and hug—the other trees. The men back down but return with the Maharajah himself and a much larger group of determined soldiers. Just as they reach the forest, a strong sandstorm hits, so the men retreat. The trees protect the village and the well against the sandstorm. This causes an “Aha!” moment for the Maharajah, who changes his mind and decides to save the forest. The villagers celebrate! It’s nice to see a story with such courageous characters who are willing to fight for what they believe in. They won—and as a result, so did the trees—against the powerful Maharajah. This is a David and Goliath story. I think this book will give kids a new appreciation for trees—and nature in general—and their importance. Hopefully, it will inspire them to stand up for what they believe in and to not back down, even in the face of what looks like a losing battle. Too bad her fave tree got chopped down, though. A great modern tale about tree huggers!